UNITED NATIONS, January 14 -- When Somalia's Transitional Federal Government's new Prime Minister Mohamed Abdulahi Mohamed Farmajo spoke to the Press at the UN on Friday, Inner City Press expected answers about the TFG's contract with private military contractor Saracen, about Sheikh Sharif, at least about who now is the TFG's Permanent Representative to the UN. But none of these questions were answered. Inner City Press asked who has signed the contract for the TFG with Saracen, since Mohamed Abdulahi's predecessor Prime Minister Shamarke had denied he signed, has said the document used by Mohamed Abdulahi is a forgery. Video here, from Minute 1:41. “We have the letter of intent.. singed by the former Prime Minister,” Mohamed Abdulahi answered. When Inner City Press asked for his personal view on the use of mercenaries, Mohamed Abdulahi said it would be improper for him to comment for the next two weeks. Video here, from Minute 3. Mohamed Abdulahi has cracked down on charcoal exports from Somalia, calling these a product of the country's chaos. But isn't a contract with mercenaries, with a company affiliated with the brother of Yoweri Museveni president of AMISON troop contributor Uganda, a product of chaos? Inner City Press asked what will happen in August 2011 when the TFG expires -- will Sheik Sharif move to extend his term? Mohamed Abdulahi said “I don't want to speculate,” there are “several options” which will be clarified “in the next two months.” Video here, from Minute 8. What is the Security Council's, and the United States', position on democracy in Somalia? Long time UN official Charles Petrie told Inner City Press he would be working in Somalia for the TFG. But when Inner City Press asked Mohamed Abdulahi about this, Mohamed Abdulahi said “never heard of it.” Video here, from Minute 8:45. Somali sources previously told Inner City Press that the new foreign minister of the TFG had written directly to UN Secretary General Ban Ki-moon re-naming Idd Beddel Mohamed as Permanent Representative, and saying that the long time Permanent Representative was being recalled to Somalia. We can confirm receipt of a 17 December letter from the Somali Foreign Minister recalling the Permanent Representative for consultations. 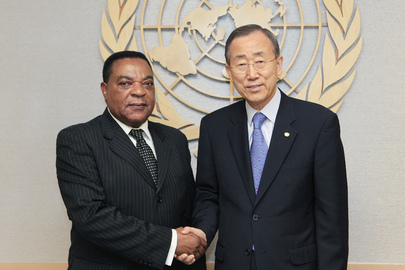 The Permanent Representative himself sent the Secretary-General a 22 December letter confirming his recall. Inner City Press prepared to write a follow up article, but wanted to speak to Idd Beddel Mohamed himself. But on January 5 in front of the first UN Security Council meeting of the year, Idd Beddel Mohamed refused to answer any Press questions. On January 12, he chided Inner City Press for its articles. Inner City Press said that, since it covers Somalia, it will be better to speak, to be professional. On January 14, Inner City Press spoke with the long time Permanent Representative and his staff. Who is running the Somali mission? Mohamed Abdulahi wouldn't say. He answered that “we have an ambassador, he is with me here today, that is an internal matter.” Video here, from Minute 7:05. Which one is the Ambassador? Watch this site. UNITED NATIONS, December 27 -- Amid growing doubts about private military contractor Saracen working for the Somali Transitional Federal Government and Puntland, the lawyer for the program, former US Ambassador at Large for War Crimes Pierre Prosper, spoke to a half dozen UN correspondents on December 23, ostensibly on background. 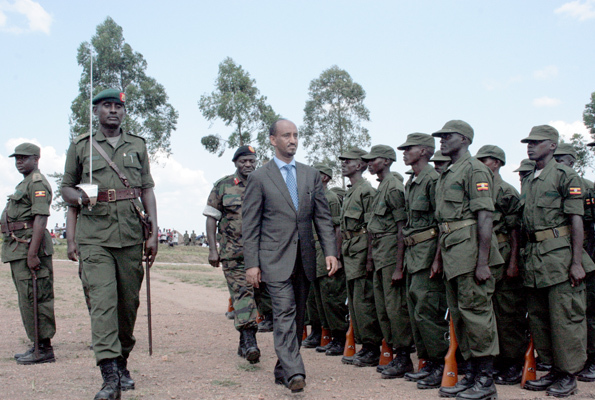 Inner City Press asked Prosper about the involvement in Saracen of a brother of President Museveni of Uganda, which provides the majority of African Union peacekeepers to the TFG. Prosper's answer involved different arms of Saracen, one in South Africa as opposed to the Uganda based arm in which Museveni's brother is involved. When Uganda's Permanent Representative to the UN Ruhakana Rugunda gave a briefing later in the day, Inner City Press asked about Museveni's brother's interest in Saracen. He is a retired general, Rugunda answered, of course he wants to stay involved in the field. Rugunda said that Saracen's “private” work “has nothing to do with AMISOM,” the African Union peacekeepers. Video here. Does that mean the two don't coordinate? Despite three rounds of questions, two on the record and one on background, this use of mercenaries in Somalia gets more and more murky. Who is funding it? Watch this site. Footnote: Ambassador Heller's and Rugunda's press conferences were in connection with each leaving the Council after two years. We hope to cover this wider context in the next few days. And we will report anything we hear on the record from Saracen, "the funder" or Mr. Prosper -- even what he may think of his successor's positions on war crimes ranging from Sri Lanka to Cote d'Ivoire.